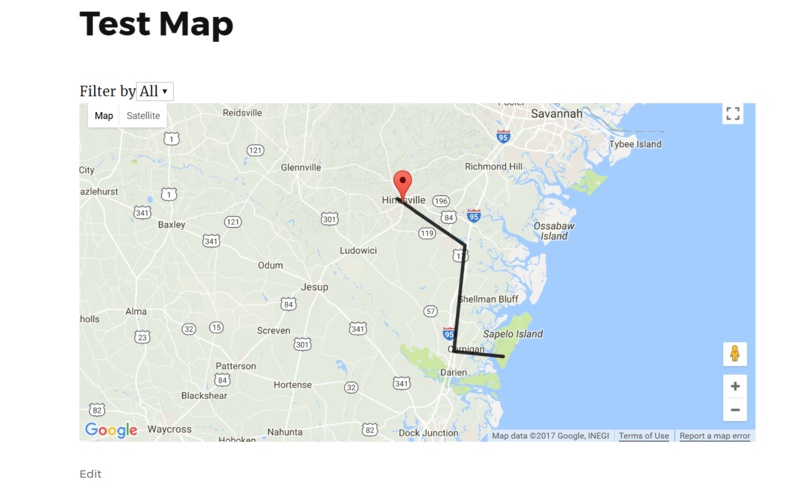 This article covers How to Create Polygons and Polylines with WP Google Maps. This documentation is current for WP Google Maps version 6. While WP Google Maps allows you to place as many markers as you need on your map, there are some things that can only be represented visually. If you were to display a marker on your map stating that you operate in a particular area (the East End of London for example), your Visitors may understand the limitations of your service area. However, they might not be familiar with the area. If you add a Polygon to the map, you could show the Visitor exactly where you work and operate. Polylines do the same thing, but with a single line instead of a shape. If you want to show your Visitors a particular route on your map (a hiking trail or special route taken by a historical figure) you are able to show your Visitors the exact route on the map. See WordPress Dashboard → Maps. Click the Edit link under the Map you want to edit. 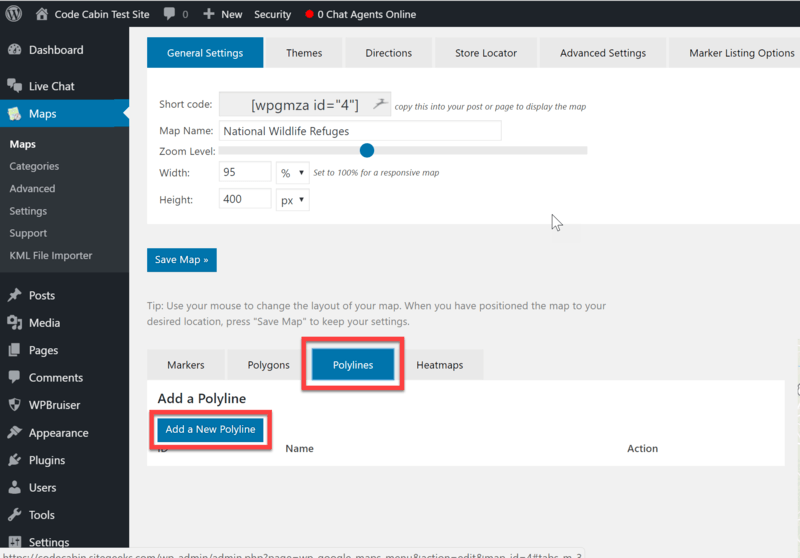 On the Create Your Map page, click the Polygon tab. Then click the Add New Polygon button. On the new screen that opens, you can enter a Name for your Polygon. If you are using WP Google Maps Pro you can also add a Title and a Link, if desired. You can also modify the colors and opacity of both the lines and fill if you’d like. To add the Polygon, you will need to left-click on the map where you will place a minimum of 3 markers (each is a vertex) for a Polygon. Once you’ve added all of the vertices (data points) for your Polygon, click the Save Polygon button at the bottom of the page. Your new Polygon will now be visible on your Map. Creating a Polyline follows the same process as adding a Polygon, except you will click on the Polylines tab and the Add a New Polyline button. The screen is slightly different however the process is the same where you can enter a name, line color, opacity and line thickness. Click the Save Polyline button when you’ve finished configuring the settings and entering the vertices for your Polyline. You can then view your map. NOTE: Special care should be taken when entering the data for Polylines and Polygons. 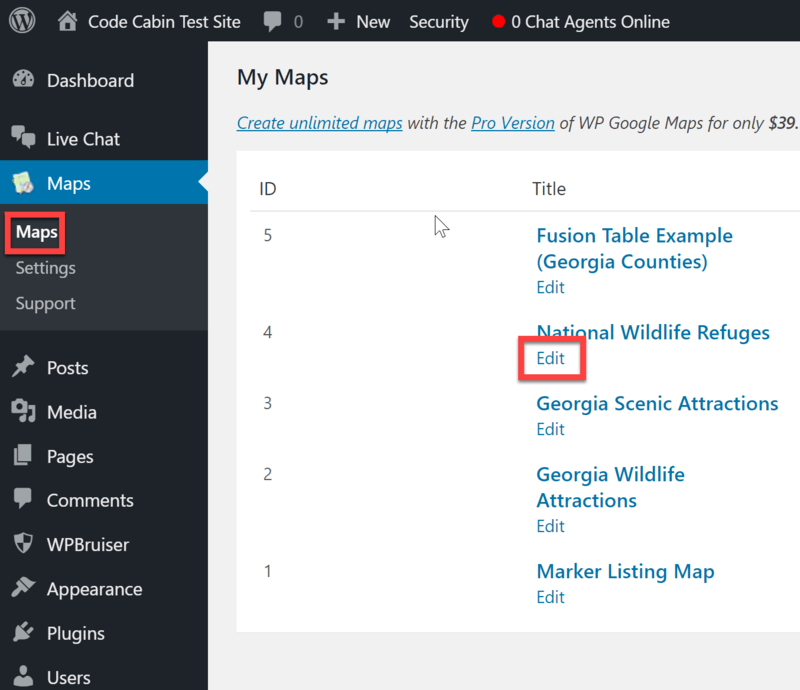 If there is any error in the input, for example you enter the same coordinate twice or you remove parentheses from the data list, your Map might no longer accept marker input instructions or even show on your site. If this has happened to your Map, please get in touch with us via our contact page and we will do our best to help you resolve the problem. 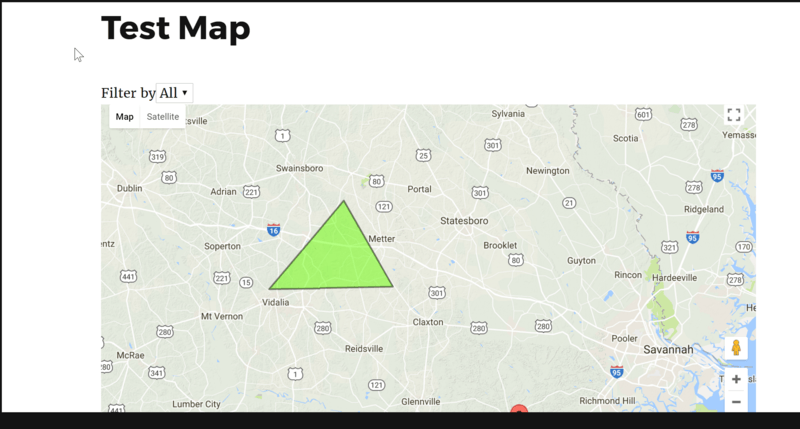 This article covers How to Create Polygons and Polylines with WP Google Maps. If you need further assistance, feel free to post on our Support Forums or visit our Support Desk.